Secretary of State Rex Tillerson delivers remarks at the Arctic Council's 20th Anniversary Welcome Reception in Fairbanks, Alaska. Photo by the Department of State, courtesy of Flickr. FAIRBANKS, Alaska — The United States ended its chairmanship of the Arctic Council yesterday amid growing international alarm that President Trump may pull out of the Paris accord on climate change. 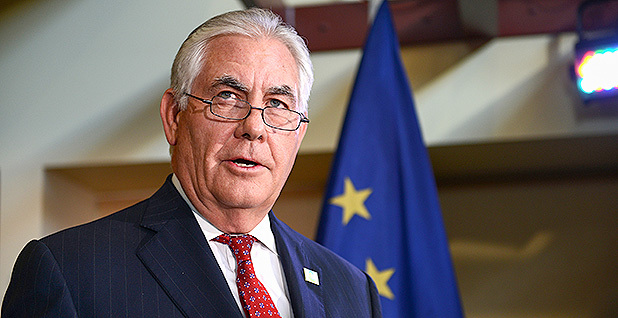 At a meeting of foreign ministers from the world's eight Arctic nations, Secretary of State Rex Tillerson acknowledged that the United States is "reviewing several important policies, including how the Trump administration will approach the issue of climate change." In his opening statement to the Arctic Council ministerial meeting, Tillerson said the United States is "appreciative that each of you has an important point of view, and you should know that we are taking the time to understand your concerns." But the former Exxon Mobil Corp. CEO flatly noted that the United States is "not going to rush to make a decision" on whether to remain in the Paris Agreement. "We're going to work to make the right decision for the United States," he said. Diplomats from other countries in the Arctic Council said the Trump administration sought last-minute changes to the ministerial statement to reflect the White House's reluctance to commit to serious climate change policies. A Finnish official said the Arctic Council foreign ministers came to Fairbanks this week believing that the ministerial declaration had been settled during negotiations held earlier this month. "But then, yesterday, we got to know that the U.S. wanted to open up some paragraphs," explained René Söderman of Finland's Ministry for Foreign Affairs. "There was a question around how strong the language could be for the Paris [accord], and on the U.N. Sustainable Development Goals," Söderman said. "There were discussions on renewable energy and so on." Some Arctic nations wanted to insert language from the Paris Agreement into the ministerial statement, now known as the Fairbanks Declaration. The statement is designed to highlight the accomplishments of the U.S. chairmanship and lay out Finland's plans to assume council leadership. But during a last-minute negotiating session Wednesday, "we were able to push the U.S. back as much as possible," Söderman said. "And they were able to [push] back as much as possible." In the end, the declaration makes a single reference acknowledging the existence of the Paris deal. "It could have been stronger language, but with a U.S. government that still has the Paris accord under consideration, this is as far as they could go," he said. During the Fairbanks meeting, the eight Arctic Council foreign ministers all signed the new document but not before many of them forcefully advocated for implementation of the Paris accord and adoption of aggressive environmental policies to curb greenhouse gas emissions. Swedish Minister for Foreign Affairs Margot Elisabeth Wallström cited a recent Arctic Council study showing that within two decades, increased warming in the northern countries is likely to cause the Arctic Ocean to be largely ice-free during the summer. That report, "Snow, Water, Ice and Permafrost in the Arctic," says the economic damages from Arctic warming could amount to as much as $90 trillion (Climatewire, April 25). Wallström argued that the Paris Agreement and the United Nations' 2030 Agenda for Sustainable Development "provide a science-based path away from these risks. ... Like no other generation before us, we have the knowledge, technology and the capacity to save our planet." Alaska's Republican senators, who hitched a plane ride with Tillerson from Washington to Fairbanks, each had a distinct perspective on the importance of the Arctic Council declaration and the Paris accord. Senate Energy and Natural Resources Chairwoman Lisa Murkowski argued that the Arctic Council ministerial statement is impressive simply because Tillerson was willing to sign the document at a time when the president "has not been overwhelming in his embrace of the realities of climate change." Trump has been dismissive of the science backing climate change, arguing that it is a Chinese hoax. "Remember, this is an administration in which some do not believe that climate change is real," Murkowski noted. "There could have been an outcome where there was no mention of climate change whatsoever [in the Fairbanks Declaration]. But that is not the case." Instead, the Arctic Council statement notes that the region is warming at more than twice the rate of the rest of the world, causing "widespread social, environmental, and economic impacts in the Arctic and worldwide." The statement includes an 11-point section on the impacts of climate change that advocates implementation of global actions to reduce greenhouse gas emissions. Murkowski said she is "agnostic" on whether the United States should remain in the Paris pact. "In fairness, I think we probably have more leverage if we stay in," she said, noting that countries taking part in the agreement could help shape implementation of the Paris initiatives. "My hope is that after seeing this declaration, Secretary Tillerson will be able to go back to the administration and make the argument that it's important to clarify our climate policy," Murkowski said. On the other hand, Alaska's junior senator, Dan Sullivan, was less convinced that the United States should remain in the Paris Agreement. Sullivan acknowledged that the Arctic is being affected by climate change. But he argued that the international climate agreement would hurt the U.S. economy. "One of the big flaws of the Paris accord is that the commitments made by China are much less stringent and serious than the ones made by the United States," he said. "And they're the biggest producer of greenhouse gas emissions in the world, and they're our biggest economic competitor. I think a lot of Americans have serious issues with that." Sullivan said he opposes environmental policies to quickly decarbonize the world economies. Such proposals are advocated by environmental groups and some Nordic nations. "Right now, my constituents here are going through a rough economic patch," he said, referring to Alaska's $3 billion budget deficit, caused when oil prices declined. "Further restricting the ability to develop and produce hydrocarbons is not what I believe is in the best interest of Alaskans and the country," Sullivan said. Yesterday's ministerial meeting marks the beginning of Finland's two-year chairmanship of the Arctic Council. Söderman said his country ranks climate change as a top issue for its two-year term as head of the Arctic Council. Finland will also focus on technology connectivity, meteorological cooperation and education in the Arctic. Finland is advocating strong environmental action under the Paris accord, Soderman said, in large part because the eight Arctic Council members are some of the world's largest emitters of greenhouse gases. Also at the ministerial meeting, the Arctic foreign ministers signed a scientific cooperation agreement aimed at opening doors for researchers from other Arctic nations. That agreement is the third binding accord negotiated under the auspices of the Arctic Council. In addition, the Arctic nations granted observer status to Switzerland and to six nongovernmental groups, including the OSPAR Commission, Oceana, the World Meteorological Organization and the International Council for the Exploration of the Sea. The ministers did not approve of requests for observer status filed by Turkey and Mongolia, as well as several policy groups. Under the Arctic Council rules, "observers" are allowed to sit in on council meetings, which are closed to the public. But they cannot join the conversation. So far, 12 nations have been approved for observer status, including China, India, Singapore and South Korea.